Fort Loramie’s Max Hoying, left, and Mark Seger bring down New Miami’s David Cunningham during a Division VIII playoff game on Nov. 3, 2018 in Fort Loramie. The Redskins may be without a conference in 2021 after the recent breakdown of the Cross County Conference. The recent shakeup in the Cross County Conference leaves the Fort Loramie High School football team and girls golf team without homes starting in the fall of 2021. If the Redskins can’t find a good conference fit by then, they’re prepared to play as an independent. That’s something Fort Loramie athletic director Mitch Westerheide is familiar with. He played during Fort Loramie’s first three varsity football seasons when the program also played an independent schedule. “All options are on the table right now,” said Westerheide, a 2008 Fort Loramie graduate. On Feb. 20, 10 CCC members announced their intention to leave the CCC and start a new 10-team conference. Those schools were Ansonia, Arcanum, Bradford, Franklin-Monroe, Mississinawa Valley, National Trail, Newton, Tri-County North, Tri-Village and Twin Valley South. Covington was invited but declined, while Bethel and Miami East were not invited. On Monday, a new eight-team conference was announced that included Bethel, Covington, Lehman Catholic, Miami East, Milton-Union, Northridge, Riverside and Troy Christian. Both new leagues will start play with the 2021-2022 school year. Until then the CCC remains intact. Fort Loramie was in talks to remain with Bethel, Covington and Miami East. But other league members wanted full sports membership across the board, meaning Fort Loramie would have to leave the Shelby County Athletic League entirely. A seven-school conference with members competing in all sports. Fort Loramie would remain in the SCAL and compete in football only for an eight-team football conference to balance scheduling. An eight-team conference with members competing in all sports. Fort Loramie would remain in the SCAL and compete in football only, and find another football-only program for a 10-team football conference. “I think they had their mind made up they wanted eight full memberships,” Westerheide said. “We did not get a second on a motion for the options we put on the table, which is disappointing. Westerheide said the first three weeks of the 2021 football season are booked. Finding games for the next seven weeks will be challenging. The Ohio High School Athletic Association lists 25 schools as independent members. For comparison, Lima Central Catholic is independent. Last season’s football schedule included Spencerville (Division VI), Delphos St. John’s (D-VII), Ada (D-VI), Toledo Waite (D-II), Toledo Rogers (D-III), Woodlan, Ind. (D-IV), Columbus East (D-IV), Troy Christian (D-VI) and Lucas (D-VII) in Richland County. “I’m optimistic,” Wells said. “Two years is a long time and a lot of things can happen with different alignments and different conferences. We’ll see how it all shakes out. 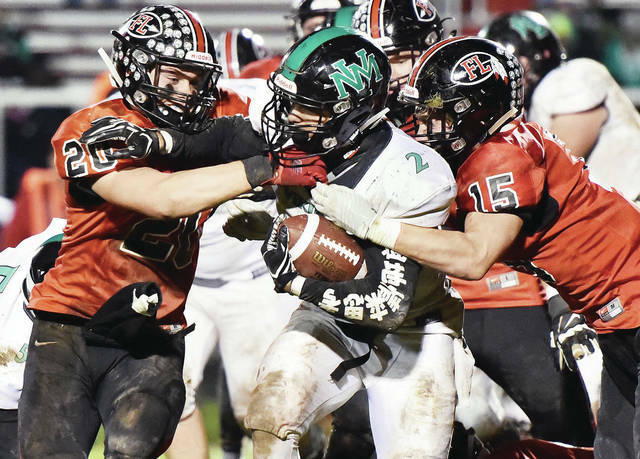 Potential opponents include Elgin, Hardin Northern, Perry, Ridgemont, Upper Scioto Valley and Waynesfield-Goshen of the Northwest Central Conference, which loses Lehman and Riverside in 2021. Fort Loramie was a member of the NWCC in football only from 2012-2016. Westerheide said he has not had any contact with the NWCC league representatives, but has contacted some of the schools about openings.